Tennessee wide receiver Marquez Callaway hugs running back Ty Chandler (8) after Chandler scored the Vols' first touchdown during their upset of No. 21 Auburn on Saturday in Auburn, Ala.
AUBURN, Ala. — The first caller to Jeremy Pruitt's weekly radio show this past Wednesday turned out to be a prankster impersonating the main character of the popular Netflix series "Ozark." Whether the first-year Tennessee football coach realized that, the question from "Marty" in Lake of the Ozarks, Missouri, stuck with Pruitt as he tried to articulate what his Volunteers' 30-24 win at No. 21 Auburn on Saturday meant. "He asked me how we compete against the top-tier programs in the country," Pruitt said. "I told him my answer is that we are a top-tier program in the country." The Vols certainly looked like one in an upset that silenced many in the crowd of 84,589 at Jordan-Hare Stadium. Redshirt sophomore quarterback Jarrett Guarantano threw for a career-high 328 yards to lead the Vols to their first Southeastern Conference victory since 2016 and their first win over an SEC West foe since 2010. The win changes the trajectory of a season that seemed destined for a sub-.500 finish after Tennessee (3-3, 1-2) lost its first three games against power conference opponents this season by 26 points each. "It means a whole lot," Guarantano said, the emotion still raw on his face just minutes after exiting a jubilant Tennessee locker room. The Tigers, coming off a 23-9 loss to Mississippi State, fell to 4-3, 1-3. An estimated 5,000 Vols fans inhabited a corner of the stadium in their program's first trip to the Plains since 2008. The atmosphere around Tennessee football had been mostly bleak since the Vols lost that day. Saturday's result gave the Tennessee faithful a reason to hope Pruitt can lead a program revitalization. The former Alabama defensive coordinator improved to 5-1 as an assistant or head coach against Auburn coach Gus Malzahn by coordinating a defensive performance that forced three key turnovers. The most important takeaway came late in the third quarter after Tennessee surged ahead 20-17 on a 12-play scoring drive. Auburn's once-lauded offense gained 5 yards on first down. Alexis Johnson Jr. and Kyle Phillips had other plans for second down. The two Tennessee defensive linemen forced quarterback Jarrett Stidham to retreat before Johnson sacked him for a loss of 15 yards and forced a fumble. A mad dash for the football ensued. It ended with freshman cornerback Alontae Taylor holding the ball in the end zone and the Vols leading 27-17 after Brent Cimaglia's extra-point kick with 2:34 left in the quarter. Breaks that went against Tennessee in an embarrassing 47-21 loss to Florida earlier in the season seemed to go the Vols' way, including a last-gasp onside kick from Auburn that Tennessee receiver Jauan Jennings calmly corralled with 37 seconds left. One Guarantano kneel-down in the victory formation ended the game. A visit from No. 1 Alabama next week could be a reminder of the chasm between Tennessee and national prominence. Breaking an 11-game SEC losing streak in emphatic fashion on the road should make that reality check more tolerable. "Great morale boost," junior receiver Marquez Callaway said. "We needed to win. I think the fans loved it; we loved it especially." 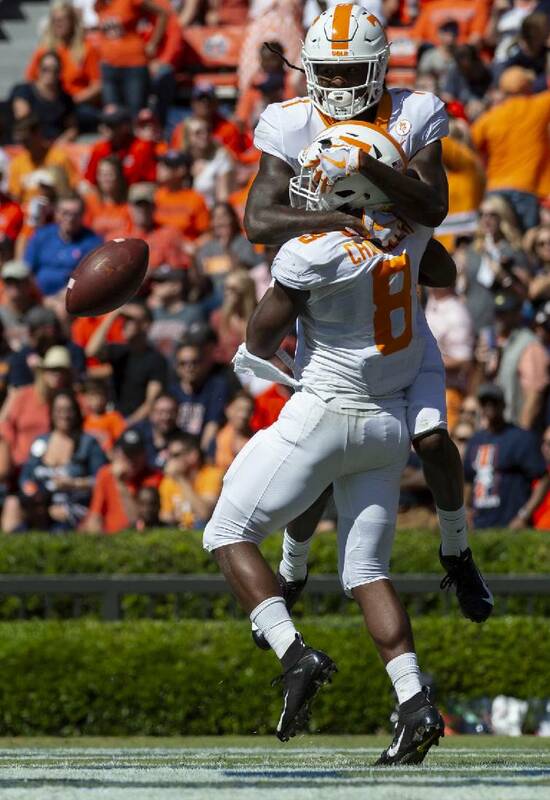 Callaway's two catches for 55 yards helped Tennessee convert third-and-long plays. The Vols were 10-of-19 on third-down conversions in the game. Guarantano completed passes on nine of the 10 conversions. "Well, I think lots of times when it comes to the quarterback position, it take the other 10 guys to be effective, and the way they play affects on how he plays," Pruitt said. "I thought he done a really good job today of him having an effect on his teammates." The Pride of the Southland Band played "Rocky Top" as Tennessee players celebrated first at midfield after postgame handshakes and then made their way toward the locker room. Fans serenaded the team with cheers as the players and coaches ducked into the bowels of the stadium with Tennessee's first victory at Auburn since 1998 secured. "Well, let me tell you, this is not an easy place to win," Pruitt said. "Nowhere is in the SEC. So to go on the road and win against a really good football team in the SEC I think speaks to how far we've came as a program in the last 10 months." Tennessee, Pruitt said, is a top-tier program. "We've just got to create a top-tier team," he said. "You know what I'm saying? Our guys are working hard to do that. The program is here. It's our job to create the right team. We're going to do it with the men in this locker room and the guys we're going to recruit." Saturday's game offered a reason to believe him.